A volunteer was out walking her dogs and when she came back home there was this little fella sitting at the main gate. After a little chasing she managed to get a lead on him and he happily followed her home. 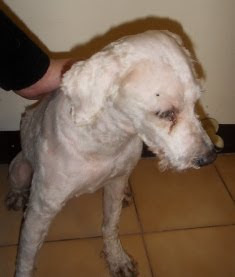 His fur was so matted and looked so painful that the volunteer decided not to wait until tomorrow to take him to a groomer, so she herself decided to shave off the mats and then the next day take him to be tidied up and washed. The mats were terrible and it took over an hour and half to shave him completely. He's a male Poodle we think. He has no chip but was wearing a yellow collar with a bell on it. It seems he's been a stray for quite some time. His teeth are in terrible condition. He has also had his vocal cords cut, so he has a raspy bark. He will be taken for a blood test and be neutered this week. Then he'll be looking for a forever home. He's friendly and well behaved. George has gone for a tryout at a new home! There are 2 white puppies up for adoption. They were born some time in January 2011. These 2 female puppies are friendly, playful, and healthy. Please contact us at 02-28338820 or adoptions@animalstaiwan.org if you can give both or one of these cuties a home. 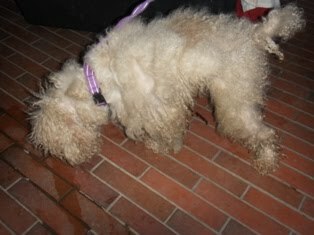 It seems another three little doggies have been dumped on the street by a nasty uncaring breeder, Gigi, Winnie and Mini. We know for sure that all have had puppies before and that Winnie has had her vocal cords removed/cut. Gigi is about 5 years old, female and spayed spayed. She’s only 7 kg, but actually she should be a little smaller as she’s a little over weight at the moment. She’s very friendly and loves to be around people. She has no health issues and is ready for adoption. 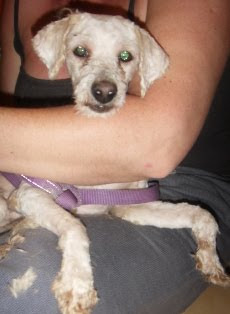 Winnie is also about 5 years old, female, spayed and only weighs 2.3 kgs. She is also very friendly. Unfortunately she does have heart worm. She has received the "treatment shot" for heart worm and we are hoping we caught it in time and she’ll recover well. Unfortunately this little lady also seems to have been in some kind of accident and is limping on her front leg. We will have her x-rayed and make sure she receives the best treatment. Then she’ll also be ready for adoption. She has had her vocal cords cut, but she’s very friendly and loves being around people. Little Mini is only 1.8 kgs. She’s female and again about 5 years old. She’s been spayed and has no health issues. She is quite shy but once she’s being held starts to relax a little. She’s never barked and would make the perfect companion. Woof Woof Woof! My name is KATO. I used to hang around near a furniture store in Neihu. Sometimes, some nice people would give me food and that’s how I survived all these days out there as a stray. Rain or shine, I’d be there so I could get something to keep my tummy happy. Although most people were kind to me, some people did not like to see me there. You know, we dogs can feel if a person is friendly and means good to us or not. So when I sensed that a person did not have good intension, I used to hide or run away as fast as I could. I almost got run by cars several times by doing this. One day, I didn’t have the same luck and a car hit me on my left rump. It hurt but I kept walking to move myself to a safer place, free of traffic. I tried to treat my wound by leaking it but it wasn’t getting any better…. It was also so cold and rainy on those days after the accident that I did not have much energy to go begging for food again. Three days after the accident, I was so tired. I did not have anything to eat and my legs were shivering. I just wanted to lay down for a while and rest. AT this time, I was very blessed that a nice lady noticed me and tried to wake me up. After several calls, I was able to stand up. I was scared in the beginning, but somehow, I knew she was trying to help me. She held me in her arms and took me to the Vet. The Vet was very nice to me. He cleaned my wound and had drawn my blood to check my health. The Vet was surprised to see that I took good care of myself while living in the streets. The lady who rescued me was also happy to know that I was a healthy dog and the open wound could be easily fixed with few stitches. I spent four days at the Vet and I am now neutered, vaccinated and micro chipped. The nice lady who rescued me is now my foster Mom and she said she will help me find a permanent home. She said, I could not go back to where I was found because that area has too much traffic and I could have another accident again. I’m trying my best to show my foster mom my appreciation. I know she doesn’t have enough space in her house to keep me because she already has two dogs who are now like my brother and sister. They are teaching me to use the bathroom and walk on the leash properly so I can be adopted more easily. I have fun with my brothers. We play every day and my foster Mom trusts me fully. She allows me to stay loose in the house and I promised her that I will behave well. My name KATO, is inspired after the handsome Taiwanese actor, Jay Chou, who has just played the role of Kato in Green Hornet movie and is my foster mom’s favorite. Please, give me a chance to be your forever companion. I only need a chance to love someone unconditionally as this is my nature.. 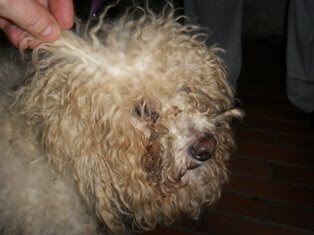 Please call Mayumi if you can give Kato a home: Mayumi@animalstaiwan.org or 02-28338820 beofe 6PM or 0910 221 501 after 6pm. We found these 3 4-month old puppies at XinDian District. They are homeless and would love to find a loving home. One's male and the other two are females. 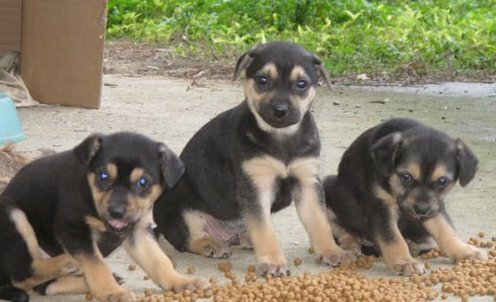 They were born around December, 2010.